ORACLE TEAM USA SPITHILL placed second and third in today’s two fleet races at ACWS – Venice to win the day. The turn-around from Thursday’s and Friday’s performances helped move Jimmy Spithill’s crew into fifth place on the leaderboard heading into tomorrow’s high-points fleet race finale. With just 7 points separating the top seven in the standings, the winner of tomorrow’s finale will win the ACWS – Venice Championship. The race awards 30 points for first place and 20 points for second, enough for any one of the top seven to leapfrog current leader Energy Team of France. 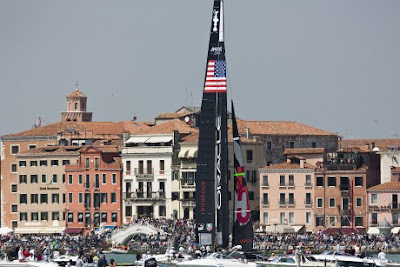 The good spirits were tempered afterwards when the Spithill quintet lost to Luna Rossa Piranha, 2-1, in the semifinal round of the match racing championship. 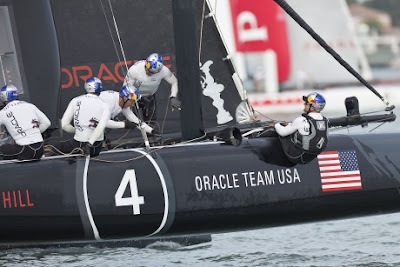 ORACLE TEAM USA SPITHILL is guaranteed third place in the match racing championship, valuable points towards the season championship. 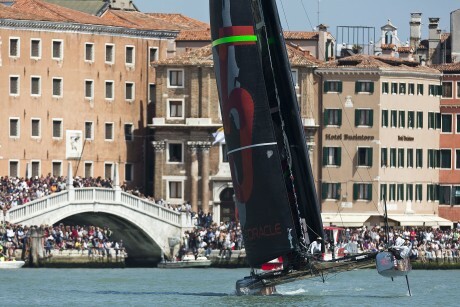 Similar to yesterday, the fleet races were held on the Grand Canal of Venice with the finish line placed off St Mark’s Square. Thousands of spectators jammed into “La Piazza” and lined the drive along the canal, while many more filled up the floating grandstand to one side of the racecourse. Still hundreds more were rafted up in private boats, enjoying the racing and warm temperatures. The winds were light, 6 to 8 knots, and the racecourse tended to be one-sided. Crews often rounded the leeward gate to port, setting up for a one or two-tack leg to the windward mark. In the second race, the course was so short that the leaders completed many of the legs in two and a half minutes or less. Part of Spithill’s success today was being free of pre-race commitments, and his crew able to apply total concentration to the racing. ORACLE TEAM USA BUNDOCK remained in eighth place in the standings. The crew led by skipper Darren Bundock had a nice start lined up in the first race but was on the course side at the starting signal. The ensuing penalty placed the crew too far behind in the light air and short course. “It was a pretty disappointing day, frustrating in fact because it’s not the result we want or we're used to,” said Bundock. 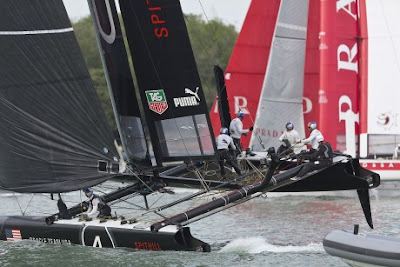 “Yes, we’ve had some crew changes and most of the other teams have been pretty consistent, so that's probably a factor. “But we haven't been getting off the start line well. It's a very tight space and here in the Canal there is a current which sweeps you towards the line. Once you're behind, the course was pretty much a one way track up and down the boundary, so the opportunities were minimal,” Bundock said.